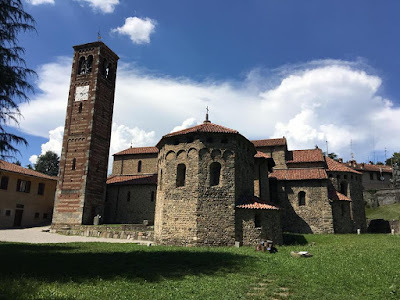 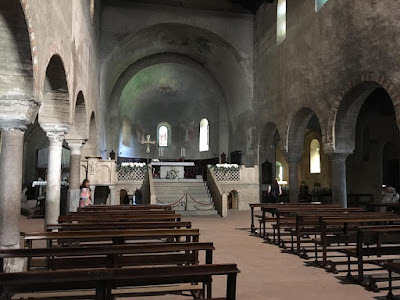 The Basilica of Ss Peter and Paul in the Lombard town of Agliate was built between the mid-9th and mid-11th centuries, but owes its current appearance to significant restorations done in the 1890s. 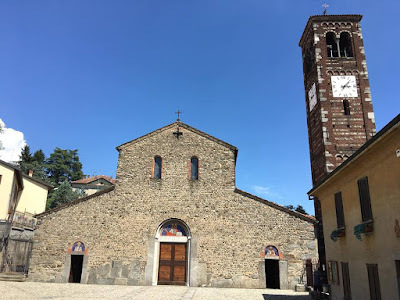 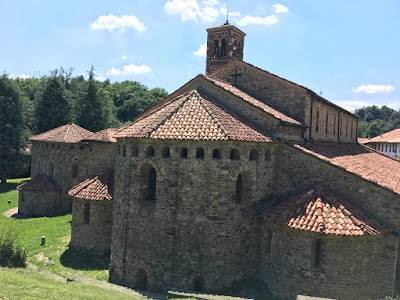 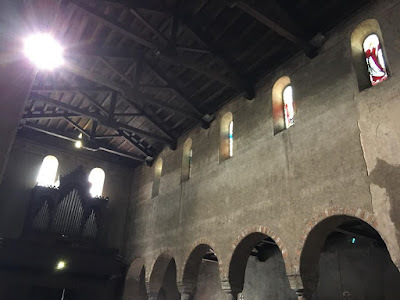 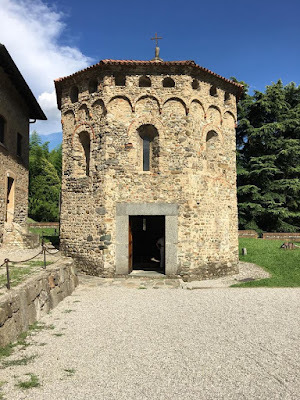 A significant amount of ancient Roman material was incorporated into the structure of the church, which has three naves, as well as the sacristy, bell-tower and detached baptistery. Thanks once again to Nicola for the pictures. The bell-tower and baptistery on the south side of the church. 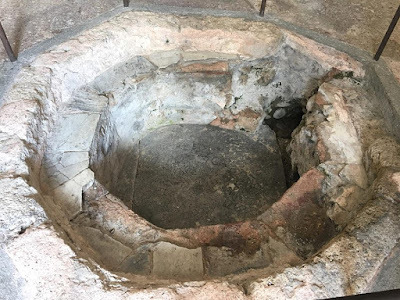 In 1578, during a pastoral visit by St Charles Borromeo, the altar in the baptistery’s apse was demolished, and a reliquary in three parts was discovered underneath it, datable to the end of the 6th or beginning of the 7th century. 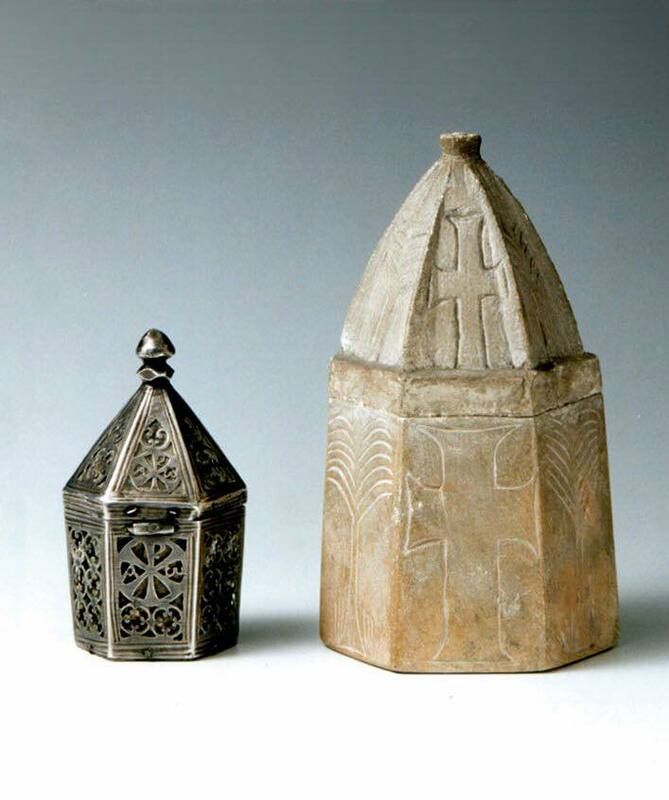 The external container in stone (right), decorated with palms and crosses, had inside it the very finely-made silver capsule seen here on the left, with the round chrismon on the main side, and the alpha and omega. 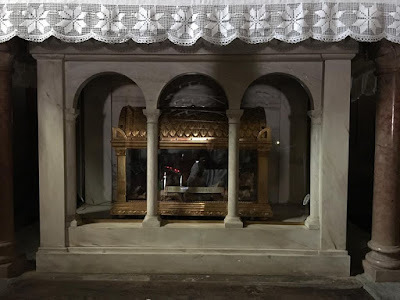 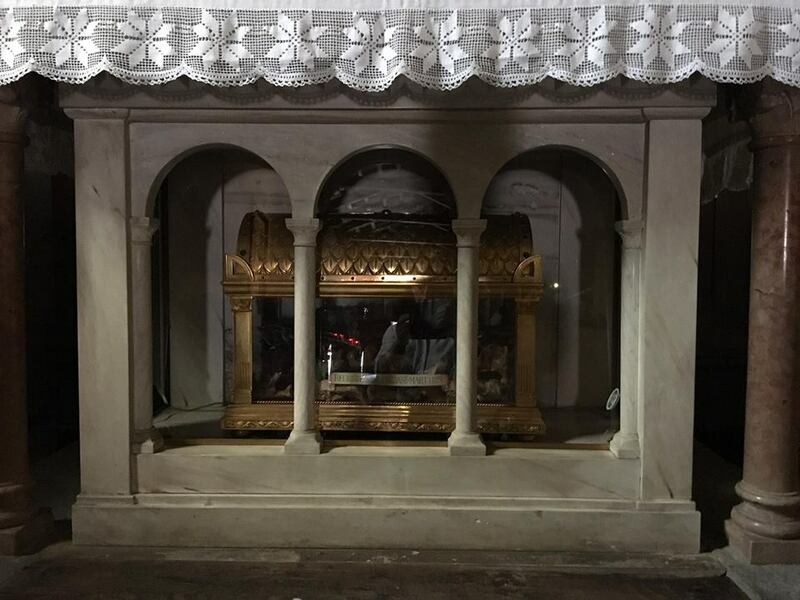 A third container, made of glass and now lost, was inside the silver one, and contained the relics. The form of the reliquary is quite different from any other found in the region, and suggests the shape of the church of the Holy Sepulcher in Jerusalem. The main apse of the Basilica. 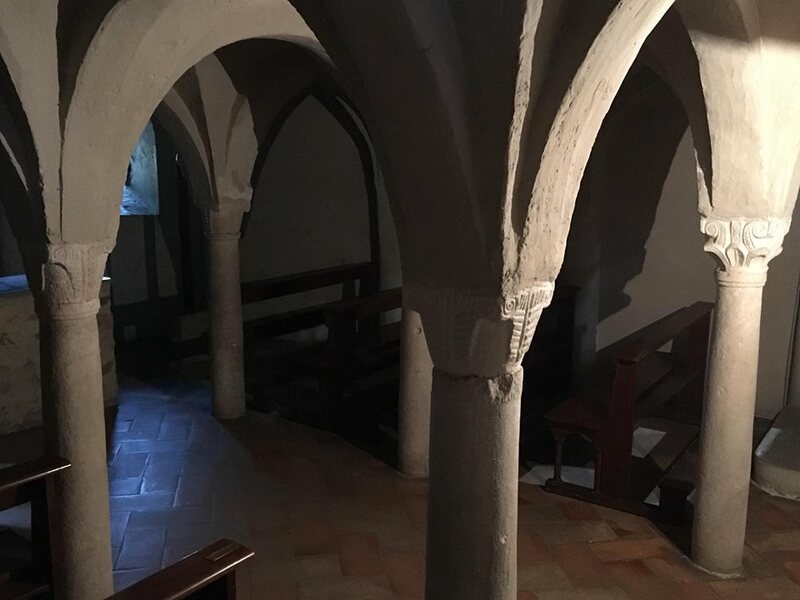 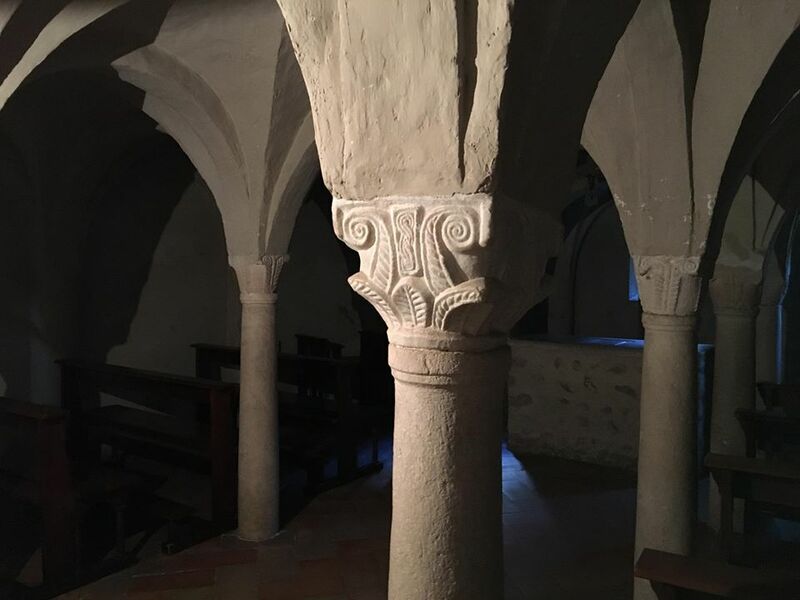 The elevated sanctuary, with the crypt underneath it (accessed through the low arches on either side of the staircase that leads into the presbytery) is very typical of early medieval Italy. 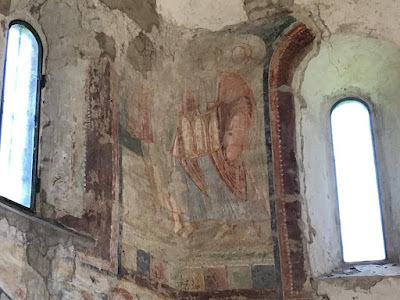 Very little of the church’s fresco decoration has been preserved, and that in rather poor condition. 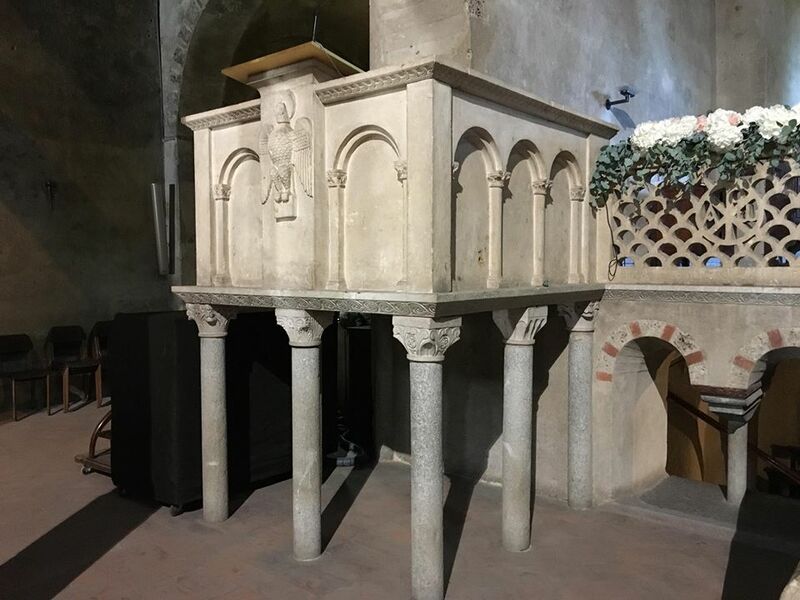 The pulpit is a modern work of 1894, successfully imitating the style of the period when the church was originally constructed. Part of the relics of St Blaise are kept in one of the side altars. 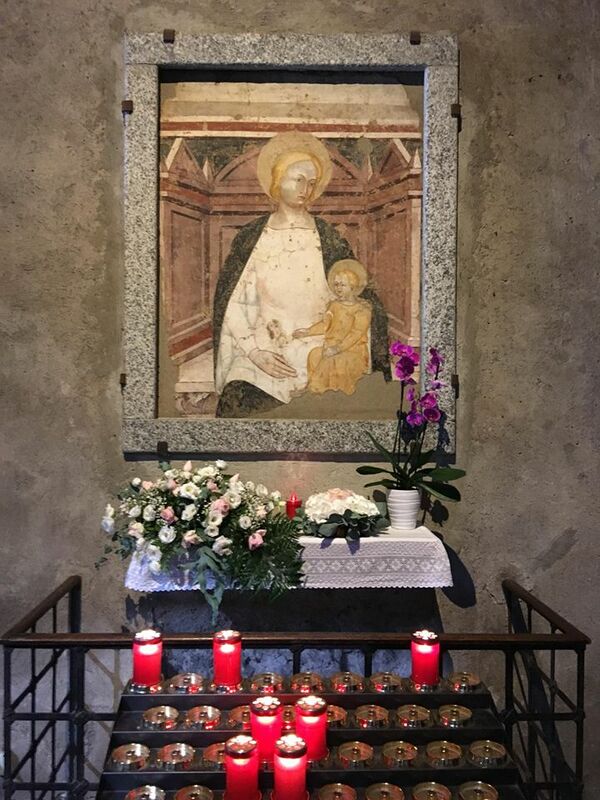 A late 15th-century fresco of the Madonna and Child on the wall to the right of the main altar. 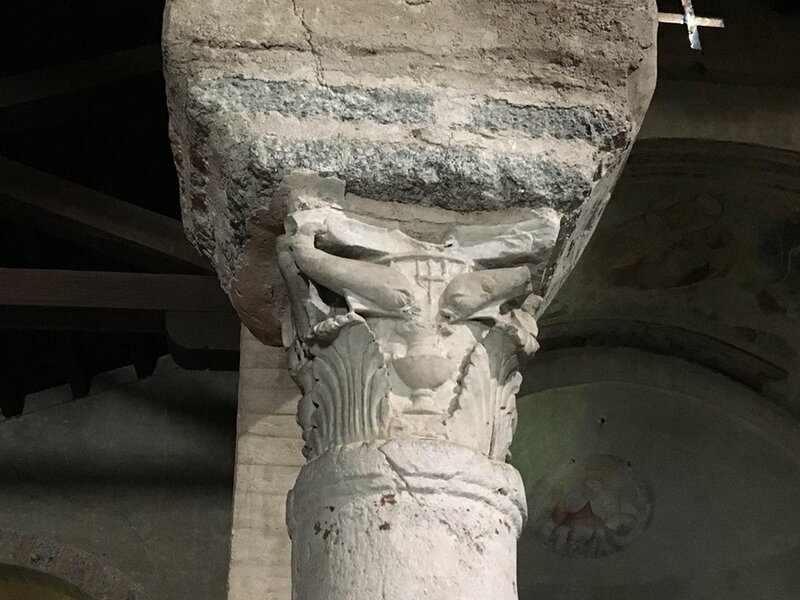 A Roman capital carved with dolphins and a trident, which may have been reused from the ruins of a temple dedicated to Neptune. 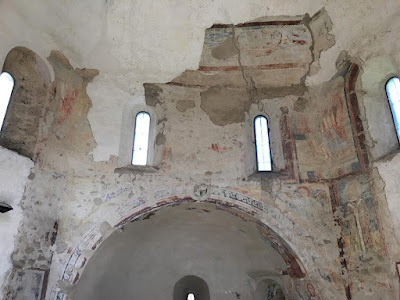 The high, flat walls, typical of the Ottonian period, would originally have been covered with frescoes. A Romanesque capital in the crypt. The baptistery stands on the south side of the church; the structure has nine sides, two of which are united in the lower part to form a large apse. 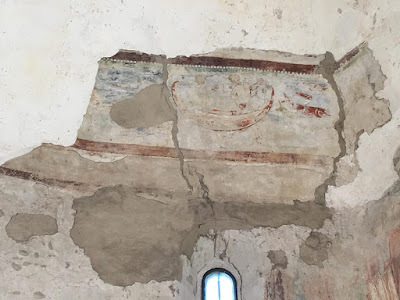 Here, more of the fresco work from two different periods is preserved, and in better condition. 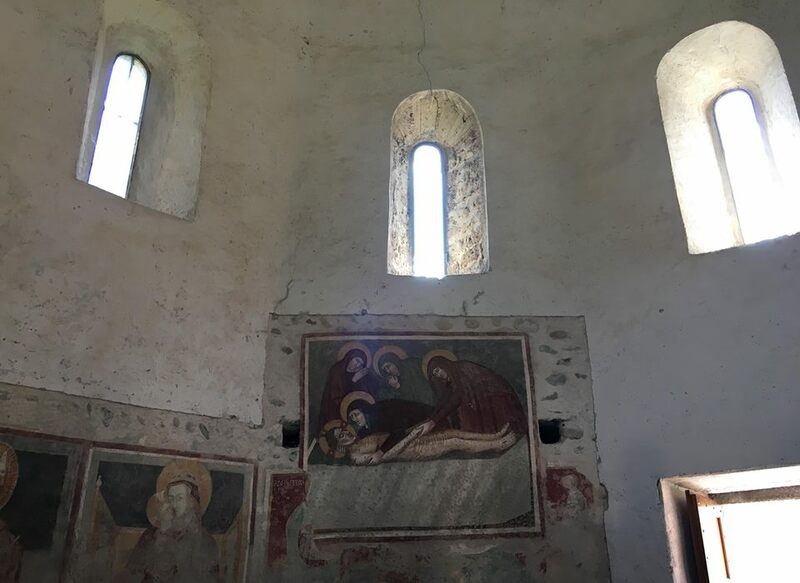 The apse where the reliquary mentioned above was found. 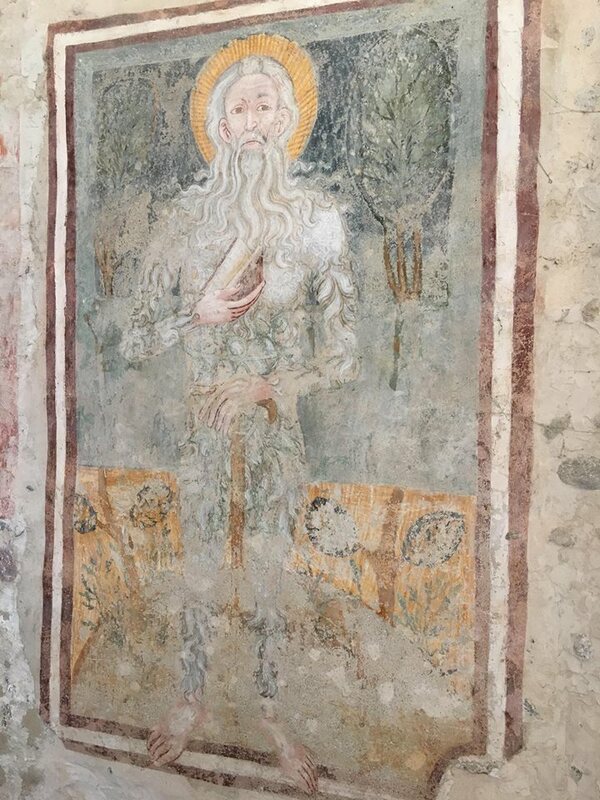 A 15th-century fresco of the hermit St Onuphrius. 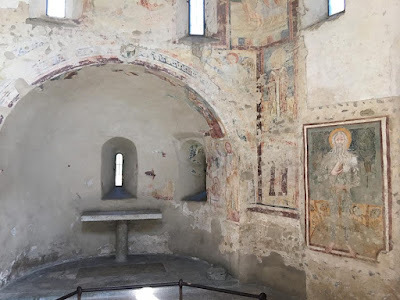 15th-century frescos of St Blaise and the Madonna and Child. 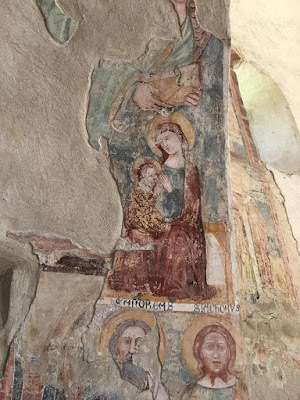 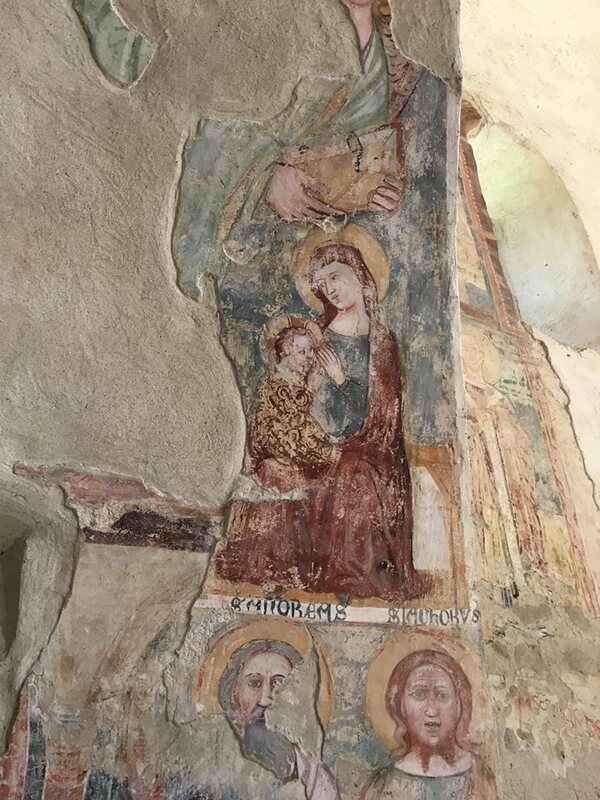 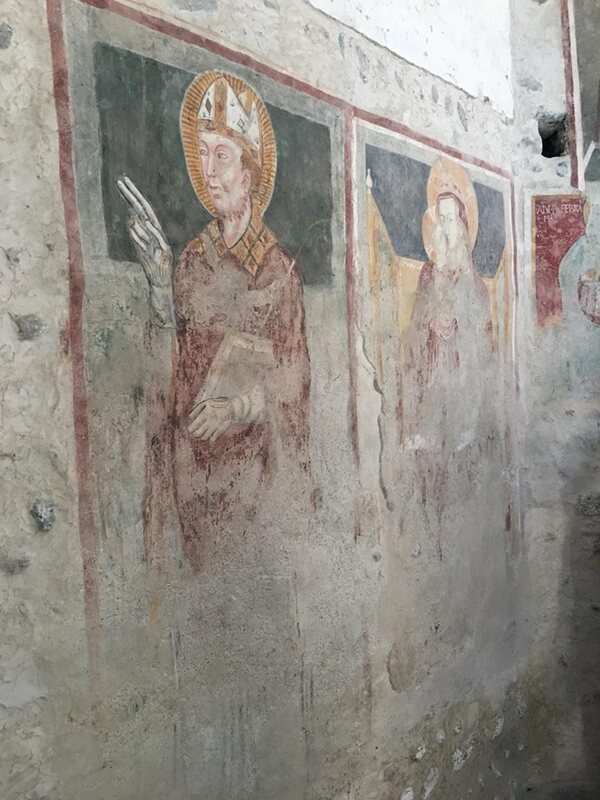 A palimpsest fresco; the Madonna and Child above, and the Apostles Andrew and James below, were painted in the 14th century, covering the original layer of fresco, which is now partially exposed as pieces of the newer layer have fallen off. Some of the original frescos from the time of the baptistery’s construction in the 11th century. 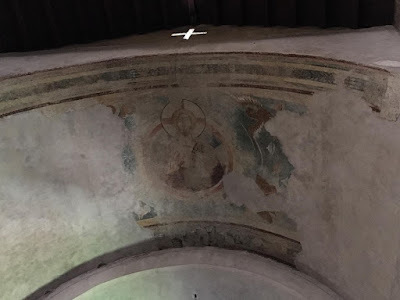 The scene over the apse was that of the Baptism of Christ. 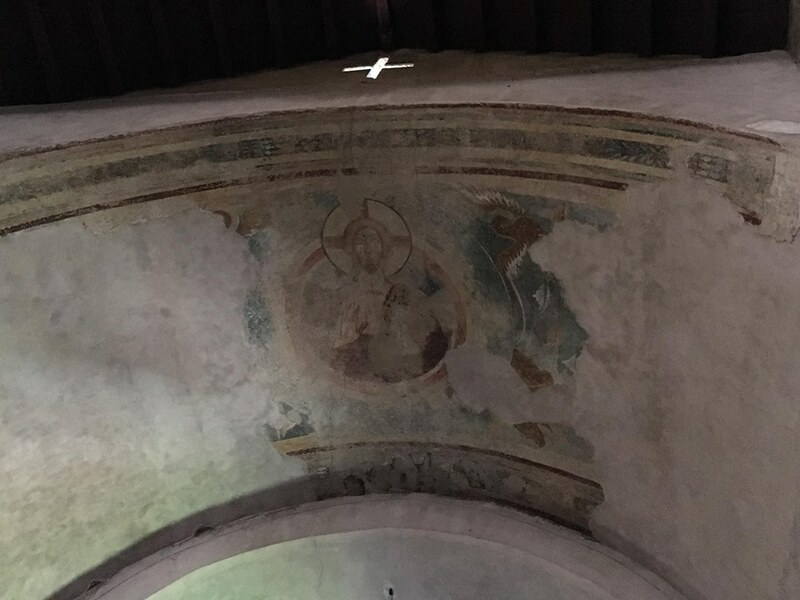 Angels coming to attend Christ. The Calling of Ss Peter and Andrew. A Deposition of the 14th century, in the style of Giotto. 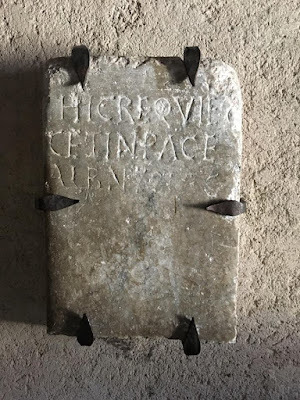 A paleochristian funerary stone, of “the reader Albinus”.